Accommodation in Rome: What is important when choosing a hotel? Rome is a very big city with many tourists. According to statistics, every year 10.5 million visitors come to the capital of Italy. Thus, Rome is in the top 10 most visited cities worldwide. All these people have to stay somewhere. There are about 18,000 hotels, guesthouses, hostels, youth hostels, camping sites and landlords of holiday apartments in Rome. With this number it is not easy to find the best accommodation. A good idea is to search the huge Booking.com search engine on the Internet for the ideal accommodation in Rome. 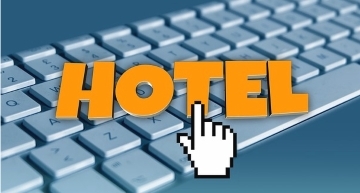 Most tourists nowadays book their hotel on the Internet. Location of accommodation: We believe that this is one of the most important criteria for selection. Almost every tourist in Rome wants to see the big sights like the city centre, the Vatican with museum and the Colosseum. There are a lot of hotels around the Termini Station (Rome Central Station). Tourists who are not looking for a luxury hotel, but a very normal hotel or also a cheap pension are very well taken care of in this area. Some sightseeings can be reached from here on foot in less than 30 minutes. But the Vatican is a little further away from the big station of Rome, but with the subway, one is also quite fast in the Vatican. There is an incredible number of over 1000 hotels and other tourist accommodation in Rome’s railway station district. Quality of accommodation: Rome has everything from a cheap hotel to a 5-star luxury hotel. Since some years there are also more and more hostels. These are private youth hostels. Most hostels and youth hostels in Rome have dormitories as well as private single or double rooms. Most rooms are relatively inexpensive, but not infrequently without a private bathroom. Accommodation facilities: For many tourists, a private bathroom is the most important thing. This is often followed by WIFI and television. In Italy, many hotels have hundreds of TV channels, but most of them are in Italian. You are happy about the TV, but you switch it off after 10 minutes. Only few accommodations in Rome offer German television in the hotel room. Internet. (WLAN) is available in many hotels and is free in the majority of accommodations and very important to most tourists. Italians have little or no breakfast in their accommodation. Therefore, on average, breakfast in the hotels in Italy, if offered at all, is rather a disappointment for many tourists. In the morning, the accommodation in Rome almost always serves a lot of sweets in the form of cakes and stuffed croissants. In international top hotels this is of course quite different in Rome. Prices hotels and pensions Rome: The prices are very strongly dependent on the season. For a hotel, which costs in January 30 euro, must put in August loosely a price of 100 euro and more per room on the table. On average, hotels and pensions in Rome cost about as much as in Germany. Those who can should avoid the high season. We also love Rome and especially in winter. As already mentioned, our proposal for tourists is an accommodation near the main railway station Rome. Last time we were in the Hotel Orlanda, about 5 minutes walk from the main station Statione Termini. The pension with about 20 rooms, it is on the 3rd floor of a normal house. The staff at Orlanda are very nice and happy to help with questions about Rome. The internet worked very well during our stay in 2017. Coffee, tea and small croissants are free all day. More info and prices Hotel Orlanda. The small Hotel Central Lodge has a similarly good reputation (18 rooms, also in the station quarter, 10 minutes walk from the Termini station). It is even closer to the subway station Vittorio Emanuele (line B). Plus points are the new facility, 24-hour open reception, clean rooms, good reviews on the Internet, free WLAN and nice hotel staff. Outside the season, the Central Lodge Hotel sometimes offers rooms for less than 50 euros including breakfast. More info and prices. Many people, especially families, are looking for a good holiday home in Rome. A super overview of several 1000 holiday homes in Rome can be found on this page. Who would like to afford a little more luxury should have a look at the page of the Starhotels Metropole. Very good 4-star accommodation with over 200 rooms, also close to the main train station. Very often on the Internet booked accommodation in Rome.